Family Systems Theory was not totally new to us as we had covered the concept during our pastoral care course during the first two years of our education. The Rev. Dr. Simon Mainwaring reintroduced the concept to us during a recent day long workshop on Congregational Life and Leadership. One of the texts for the workshop was A Failure of Nerve, Leadership in the Age of the Quick Fix by Edwin H. Friedman. In his book Friedman challenges conventional leadership wisdom which he believes is highly reactive and constrained by data. In its place he argues for a more defined, clear and differentiated leadership. A differentiated leader, amongst other things, is capable of taking a stand in an intense emotional system, is able to say “I” when others demand “we”, is able to maintain a non-anxious presence in the face of anxious others and can set boundaries but still be highly interconnected (see Friedman page 183 for more on this). When you stop and think about these characteristics you realize what a good model this is. The hard question is to ask yourself if you are a well-differentiated leader. People look to their clergy to be leaders. Church systems are full of triangulations that draw people into emotional pits. Clergy are often call on and expected by many to champion the “we” and not the “I”. Being so interconnected it can be hard to simultaneously step out of the situation in order to objectively look back in. Being well differentiated however helps provide stamina and persistence in times of trial, rejection and even sabotage. As Christian’s we have a wonderful example of a differentiated leader. We need not look any further than Jesus himself. When you consider the list of traits that define a well differentiated leader and then consider the actions of Jesus we can easily see a very strong correlation. As we move through the season of Lent we remember Jesus on trial. The scene is full of anxiety, people are boiling over with emotion, and Pilate asks Jesus “Are you the king of the Jews?” (Luke 23:3). How does Jesus react? 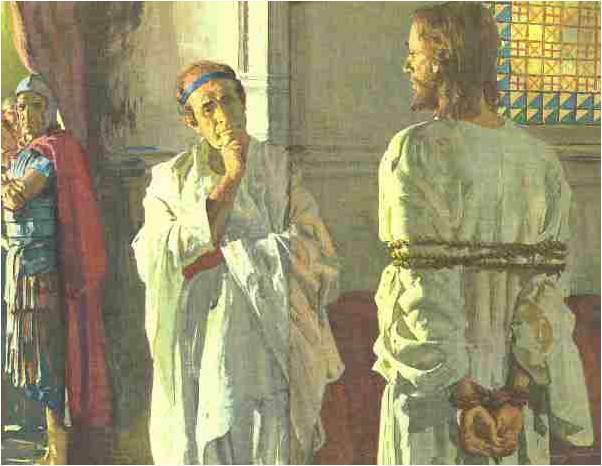 Does he give Pilate the answer he wants? Does he question who he is? Does he become anxious? A clear and simple NO to all of these questions. Jesus answers “You say so”. His answer displays perfect non-reactiveness in the face of a hostile situation. What a good model for us and what better time than Lent to reflect on our own leadership style. In a world that demands instant answers, instant reactions. In a world that wants us to be everything to everyone, maybe we should pause, step back and stand alongside Jesus. Even as Jesus differentiated himself he never left his believers but he was able to separate himself from the situation. In the quietness of Lent let us consider no just the cognitive processes of our leadership style but also let us make time to attend to the emotional dimension of who we are and how we lead. Like Jesus, let us become differentiated leaders. Posted in Richard.Tagged A Failure of Nerve, anxious, Edwin H. Friedman, Jesus, leader, Pilate, Simon Mainwaring, well-differentiated. Next Post What is your spiritual style?